The Pierateers set sail in 2009 with a simple mission: to eat and rate every type of pie they could get their gravy-soaked hands on. They knew it wasn't going to be easy; the real gems are like buried treasure, they're not always easy to track down. Or even worse... all that glitters isn't golden pie pastry. They could find themselves accidentally digging up the fool's gold of an alternative pastry product such as a slice. They rate pies by sailing the Seven Cs. These are the seven qualities that the pies will be rated on, giving an overall score out of 7 - it's how the Pierateers have always rated their pies and always will do. The Pierate Ship originally set sail with Pierateers RAS, SJL, TJP and ARL. These friends had shared a love of pies for a number of years; gatherings and roadtrips normally seemed to involve some of their favourite pastry products. It was in 2009 they started to take the passion for pies more seriously with the creation of Pierate.co.uk. It was actually the name which came first; TJP mentioned it on 29th August 2008 while playing a pirate themed board game. 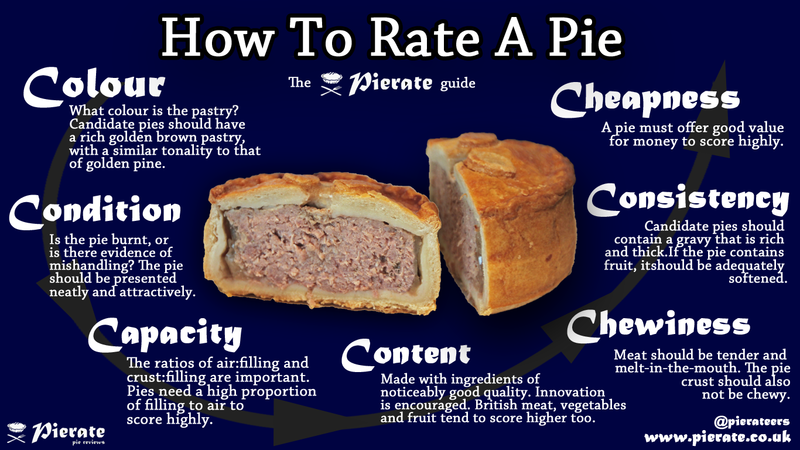 It was thought this name 'Pie-Rate' would make an excellent name for a hypothetical pie review website. On the 18th September they made a pie with the web address 'pierate.com' marked into the top. They continued to talk about 'pierate.com' as if it was a real website. Below is a message from RAS in January 2009 regarding the discovery of Urban Pie in Birmingham. "Its a historic moment 4 pie lovers everywhere and a huge find 4 fans of pierate.com! I do think we shud create a pierate thread." "Hi guys, you can log in to pierateship.blogspot.com using my email and password. 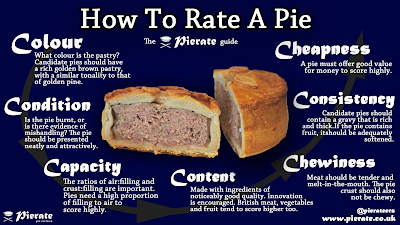 You don't have to rate your pies using the seven cs but this is just a guide. You might also like to post up other pie related news, pictures and stories." Initially there were no pie reviews - only a couple of news stories from TJP and one from RAS. The blog lay dormant for some months. A discussion over some pies in a pub was partly the inspiration for them to get started. It began to take off after the first review was completed on 20th March 2010. By the end of May they had made 27 posts although page views were very limited. A comment from SJL at this time summed up the ethos of why they carried on rating pies. "Surely it won't be long until we break through to the mainstream! .... or not, but i'd be eating the pies anyway so why not talk about them too?" Things carried on at a steady pace, with the landmark of the 100th pie review being reached on 19th July 2012. At the end of 2012 TJP created a Twitter account. This was an excellent move as it allow Pierate to connect with the people who wanted to know about pies. This also coincided with a period of redesign for the website and movement up search engine rankings. Pageviews increased and consequently The Pierateers started taking things more seriously. 2013 saw a large increase in the number of posts and pies being reviewed. In less than a year they had doubled their reviews and reached 200 reviews. In November 2013 they reached 250 pie reviews and they reached 300 pie reviews in January 2014. During this time, Pierateer RAS became the de facto captain of the Pierate Ship, taking every opportunity he could to promote Pierate. He expertly navigated through the choppy seas of social media and picked up over 2000 Twitter followers along the way. In 2013 Pierateer ALE boarded the ship as a permanent Gluten Free pie review specialist. Soon after The Ship's Cook became the pie recipe reviewer because everyone loves a home made pie. The pies and posts continue to sail in, with a special video created to mark our 500th pie post on pierate.co.uk on 9th August 2014. And we were delighted to be called upon by BBC Sport to provide expert pie analysis on the "Pies of Football" in October 2014, featuring in a video on the BBC Sport website. In November 2014 we celebrated our 5th Anniversary with a pie party and were delighted to film once again with the BBC, this time for "Rip Off Britain: Food" in February 2015, as a football pie expert. This was originally featured in an episode in April 2015 and again in August 2015. In amongst all this, we celebrated our 500th pie review in Southend-on-Sea in March 2015 and have done a number of additional Radio appearances, including BBC Radio 5 Live on the Price of Football Survey. Pierateer SJL puts his passion for pies down to two things. Firstly, his Gran used to buy the excellent steak pies from King's Farm Shop in Wendover which have been in the top 10 on pierate for a number of years. Secondly because he didn't like fish he always used to get pie and chips instead. This meant he developed a love for Pukka steak pies where he used to take the lid off and dip chips inside. SJL grew up on a dairy farm in Buckinghamshire, studied Physics at university and now lives in Gloucester. Pierateer SJL is known to be quite strict with his pie definition and is reluctant to review anything not fully encased in pastry. Don't dare to ask him to review an 'open-top pie'. He quotes the highlight of his pie reviewing career as a trip to Scotland to judge at the Scotch Pie Awards during which time he also took a tour around the pie production facility at JB Christie; the 2013 World Scotch Pie Champions. Pierateer RAS has always believed he had northern roots, despite being born in Southend on Sea (which we all know features the longest pleasure pier in the world). His love of pie and gravy was well documented before the creation of Pierate.co.uk and his slightly obsessive behaviour and random creativity has led to many “interesting ideas” becoming reality. These include the “Pie Factor” series of reviews – where he interviewed a number of pies regarding their performance on the dinner plate – sponsoring and attending a Pirate-related Pantomime and singing in and video editing the “12 Pies of Christmas” music video. After being set up by Pierateer TJP, Pierateer RAS has taken a lead role in developing the @pierateers twitter account and is largely responsible for the thousands of tweets! He has skillfully promoted the Pierate brand on twitter, managed to negotiate more free pies than he can recall, designed the Pierate Ship logo which adorns much of the Pierate merchandise (t-shirts, mugs, pens…), administers the Pie Dictionary and organised the successful first Pierate Pie Contest. In his spare time, he writes plenty of pie reviews to keep up his end of the bargain and was delighted to be featured as a "pie expert" on BBC One's hit TV show "Rip Off Britain"! Pielight - Getting his Crocodile Pie rated by Michelin Star chef Michel Roux Jr when appearing on TV on "The Great British Bake Off: An Extra Slice" and appearing on the BBC Sport website talking best football pies! Once described as "certainly passionate about pies", Pierateer TJP always has room for more pastry in his life. He has fond memories of eating hot pies in the school playground, and this love of the hot beige pastry-based parcels has certainly stayed with him throughout his older years. When he's not complaining about his backlog of pie reviews, he can be found fiddling around with a new blog tool or pie-related video. He currently resides in London, and is keen to make sure he samples more market stalls and independent pie retailers in the nation's capital. The highlight of his pie reviewing career is reportedly eating an award-winning pie in the geothermally active town of Rotorua, New Zealand. While Pierateer TJP obviously subscribes to the definition of a pie being totally and wholly encased in pastry, he is perhaps more prone to the occasional "off-piste" review than the other Pierateers, most notably enjoying a bottom-crust delight from Eat My Pies. Favourite posts from others - Edinburgh Scotch Pie Tour, Have Marks and Spencer got the Pie Factor?! Not as prolific these days as the other three original Pierateers but ARL has certainly always had a love of pies. In 2008 she came up with the 'pie in a box' idea when she realised that all the ingredients for a pie could comfortably be posted to SJL to keep him in pies while at university. She was also always on hand to bake a pie when necessary. In 2014 ARL became a vegetarian which has drastically limited her intake of pies. However, she is now able to review all the non-meat pies that the other pierateers spurn. ARL is also originally from Buckinghamshire where all the pierateers met. 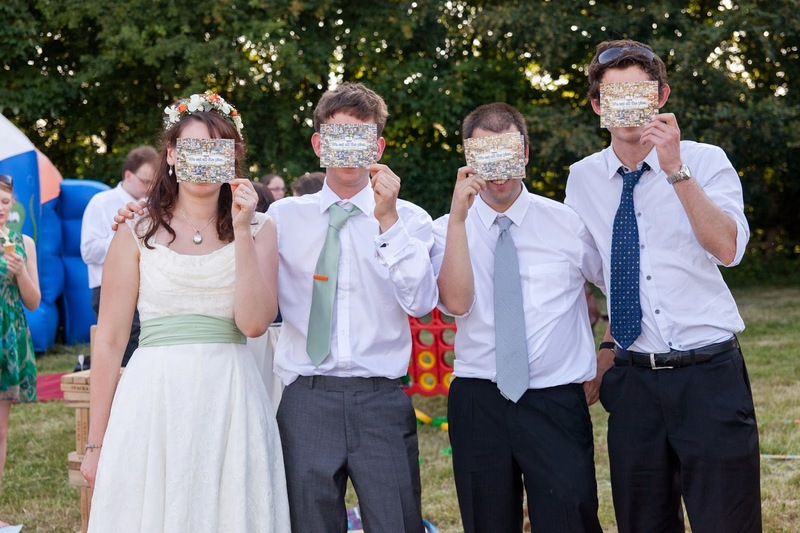 She got married to GHH in 2013 and now lives near Basingstoke with her husband and their treasured cats. Pierateer ALE boarded The Pierate Ship on the 4th October 2013 as the Gluten Free pie reviewer. ALE is a coeliac which means she is effectively allergic to gluten. She developed this condition in 2008 and has since avoided eating any gluten. To allow ALE to join in the love of pie this has often meant The Pierateers have eaten home made gluten free pies. However, recently more Gluten Free pies have been available for sale so it made sense for ALE to take the responsibility for reviewing these. ALE only scores pies relative to other Gluten Free pies. ALE is from Somerset and now lives with Pierateer SJL in Gloucester. The Ship’s Cook was taught to bake by her Mum and Grandad when she was little. One of her earliest memories is baking apple pie and jam tarts, but she’s also a fan of cakes, biscuits and puddings. The Ship’s Cook has long been cooking pies for the Pierateers to eat, but in 2013 it was noted that the Pierate Ship was lacking in recipe reviews as the focus on pie reviews had intensified. On 24th November she posted the first proper reci-pie review seen on Pierate, with the final results compared against the 7 Cs. 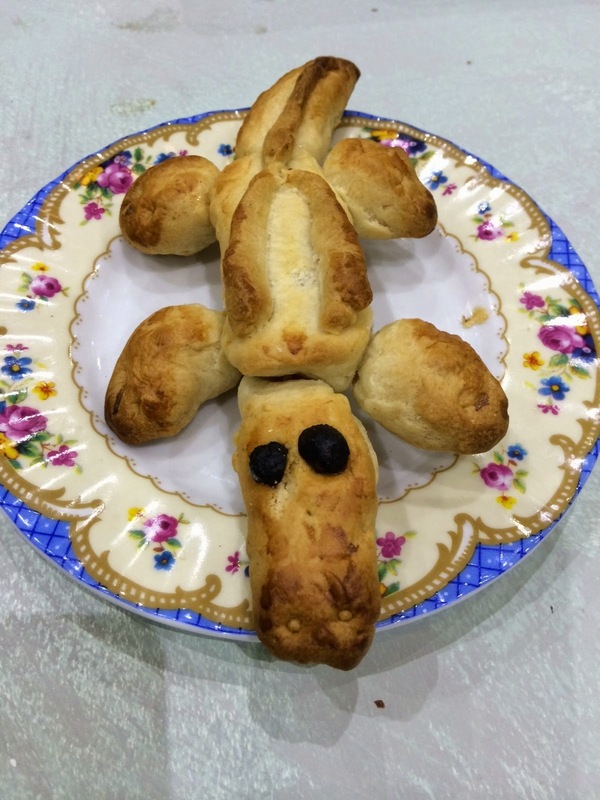 Her most popular pie recipe review was a Great British Bake Off Pie-Off between Mary Berry and Paul Hollywood and she also appeared alongside Pierateer RAS when the Pierateers made their TV debut on "Great British Bake Off: An Extra Slice". Originally from Buckinghamshire, The Ship’s Cook now lives in Cambridge with her husband, who luckily doesn’t mind eating pie all the time. You can see all the reci-pies made and rated by the Ship's Cook here. We're a chatty bunch and love to talk about pies whatever the occasion - whether that's on the radio, television, on the web or in print! Don't hesitate to contact us if you need a pie expert! We are very responsive to our Twitter account @pierateers! Follow @pierateers or send us an email!